I'm not sure if your brain works even remotely like mine (probably to your benefit if it doesn't), but I remember the moment I saw this bracelet come through my inbox in the lastest Uncovet newsletter and, instead of wanting to click 'buy'.... I immediatly went out and bought the supplies myself. And, might I add, for a fraction of the cost it was to purchase it. Uncovet= 0; Amy = 1. - Start by wrapping the cord around your wrist and cut it so you have the desired length. Measure it. Then cut that in half. Lay out the stone and end caps and cut down the cord to keep it at the original length with the stone and caps included now. I cut off about a tip of a fingers worth on each. Remember, you can always take more off, but you can add it back on. - Super glue the end caps to one side. I then attached a jump ring to each side and the lobster clap to one side. Repeat and glue end caps to the other side. I got a little super glue happy and some of mine squeezed down the side of the caps..... so try not to do as I did and go easy on the super glue! - Attach jump rings to those ends as well. 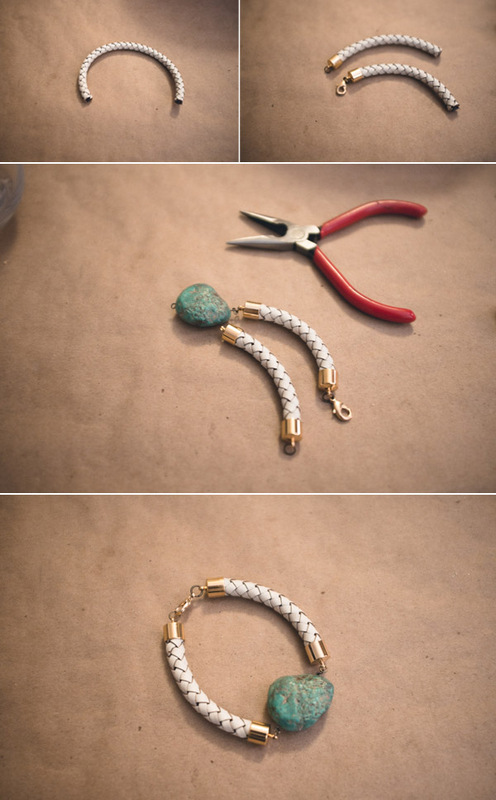 - Put the eye pin through the stone and, using the pliers, curve the end in a circle to match the other side. This is tricky at times, but watch this video to get some pointers. - Attach the jump rings to the eye pin circles. Closing off the circle and completing the bracelet. - All done. Now you've got yourself a cord and stone bracelet. Yee-haw! Trying to decide if I wear it alone or stack it with other bracelets. What do you think?